THE PRESTIGE is a movie you really do need to see twice. The first time for the plot, the second time for the method. This is the second time I’ve seen the movie, so I’m going to spend a good time talking about this movie in a way which would ruin it if you haven’t seen it. Sorry. SPOILERS BELOW!! 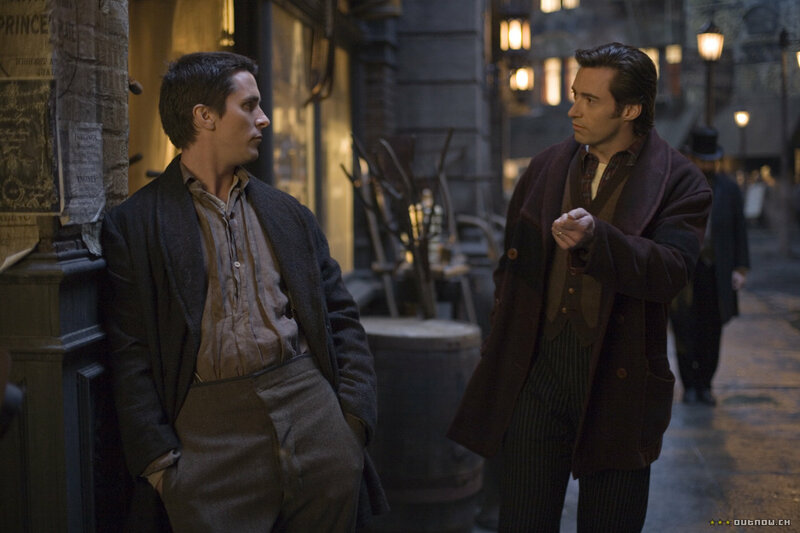 If you have not had a chance to see THE PRESTIGE, you should. It is a worthwhile movie for sure. I watched THE PRESTIGE (2006) on 11.22.14. It was my second viewing of the film, I last watch it in October of 2010. Again, this is spoiler heavy. So stay away if you haven’t seen this yet. SPOILERS AHEAD! By way of review, this movie tells the story of two competing magicians, Robert Angier (Hugh Jackman) and Alfred Borden (Christian Bale). They start off in the minor leagues together. An accident kills Angier’s wife, Julia (Piper Perabo). The question of wether Alfred was trying something he shouldn’t have been, in this case a special knot, creates a rift between the two which cannot be mended. Their mentor, Cutter (Michael Caine), sides with Robert and helps grow his career with the help of a new assistant, Olivia (Scarlett Johansson). Alfred, meanwhile, works the streets and has a grittier ascension up the ranks as he also struggles to find some normalcy with his wife, Sarah (Rebecca Hall). The trick of this movie is that (LAST SPOILER ALERT! REALLY, GO AWAY! ), through the whole thing, Alfred is actually two people. These twins take turns being Alfred or his assistant Falloh. Director Christopher Nolan exploits this concept beautifully. Watching the first time, I had no idea where it was headed. Watching it a second time, I couldn’t believe I missed it. The writing in this film is mostly wonderful. The set up is consistent, the use of character is really solid. The two leads mirror the real life competition of Tesla and Edison, a concept which is mined within the movie by introducing us to Tesla (David Bowie) as a character who has a major impact on our leads in the film. Further, it is hard to paint (for most of the movie anyway) one of our two lead protagonists as either all hero or all villain. There are wonderful shades of gray there, within Angier and Borden. There is a complaint I have, and it is what keeps this movie out of an all-time great for me. I love good mystery, and I love good sci-fi. What I am not a fan of, is a movie being one thing for the first 90%, and then changing that idea in the last 10%. This is a movie about two characters trying to best one another through slight of hand. Angier, when he can’t, uses a science-fiction trick to actually replicate himself. He then kills that clone. Now, this isn’t completely unfounded. The idea, it can be extrapolated, is that Angier is so obsessed with winning that he uses a means that is not of this world, invented by someone who has plenty of other-worldly mythology surrounding him: Tesla. But the idea of using real people in history as a mask for the fact that you are going to turn this movie into science-fiction is a wrong turn. Fortunately, this does not totally derail the movie. This is still a magnificent character study filled with a top level set-up in the script and utilizing solid performances from great actors within a movie which is wonderfully shot and beautiful to look at. The sic-fi turn at the end undermines the effectiveness slightly, but this is still a really nice movie. I may be in the minority in saying that it doesn’t belong in the top 50 all time on IMDB, but I wouldn’t complain about it being somewhere in the high 100s or low 200s. ~ by johnlink00 on November 24, 2014. I hadn’t considered your point regarding the sci-fi twist before, and it’s a good one. It may indeed have made for better storytelling if Angier had found a more real-world solution. On the other hand, I don’t have the same reaction. I like the “science is real magic” facet of the story (“Any sufficiently advanced technology is indistinguishable from magic.”). Anything involving Tesla is going to have a mythical quality to it, so in a sense I felt it was foreshadowed a bit because I expect a fictional Tesla to do something impossible. At any rate, this one remains among my all time favorites. Interesting point about Tesla. I looked at it a little different, with Tesla not ACTUALLY being able to do some of the fantastical things he supposedly did. But I don’t want to be too negative about this movie, because it is great! Such a fun movie, even if the twist at the end doesn’t fully work. But honestly, it doesn’t matter much because everything before then is so exciting and mysterious that I couldn’t tear my eyes away. Good review John. Absolutely agree. It is a riveting movie to watch. Such a wonderful blend of talent in front of the camera and behind the camera. Great post – have you read the book, sister? I have not Gramma. Is it worth it? Yep!! it’s even better than the movie!